A - Z of Islamic Signs in BSL Review and Giveaway! About a month ago I went to the annual Islamic Cultural Fayre in Bristol. I go every year and it is a great family day out. I was walking through the stalls when suddenly I spotted the stall of AminyasminLtd selling Islamic Sign Language books for children. I could not believe it. I had never seen anything like this before and, as a Speech and Language Therapist specialising in bilingualism, I was delighted. 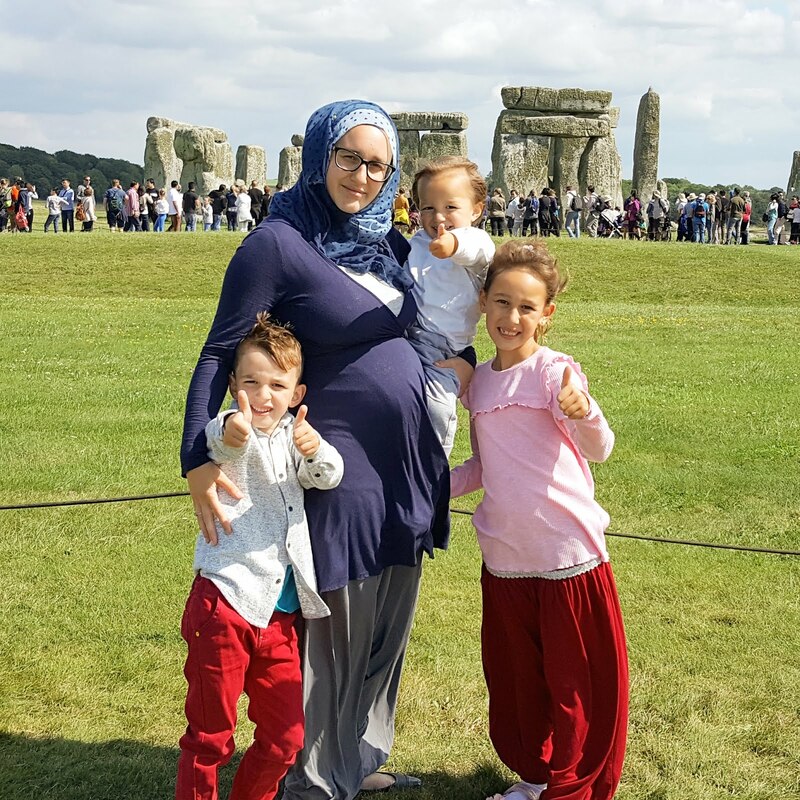 Amin and Yasmin are a brother and sister who embarked on learning British Sign Language. Through their knowledge of BSL they were able to meet, work with and support many members of the Deaf community. 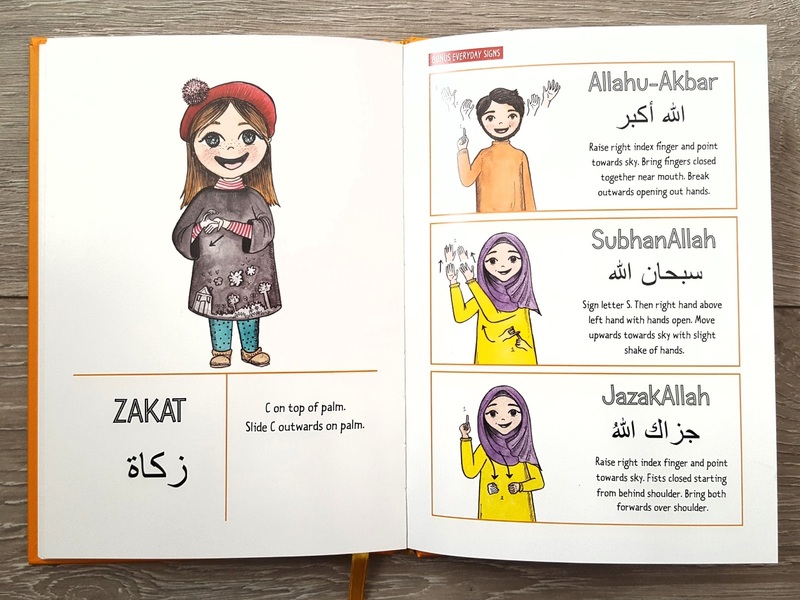 They also came into contact with individuals, families and practitioners who raised concerns about the lack of Islamic resources for members of the Muslim community who use sign language. This led them to develop this book as a way of supporting these individuals and their families and raising awareness in the wider community. I do feel that there is sometimes a lack of awareness about people with difficulties or differences within the Muslim community. I do not know any Muslims who know British Sign Language (BSL), though I have come across a few Deaf Muslims in my local community. They often find it difficult going to lectures or study circles as it is hard for them to find an interpreter. I know basic BSL but I am not at the level where I can interpret unfortunately. Getting trained in BSL is definitely on my wish list! This book by AminyasminLtd is a hard back book made of high-quality glossy paper which will be very durable over time. The front cover is bright and attractive and I like the fact there are pictures on it to show you how to sign the title of the book. Some of the signs in this book are universal but others simply did not exist and had to be created with much thought and research. The new signs were created with consultation from the British Deaf Muslim community, professionals, linguists, interpreters and sheikhs to develop the most appropriate and relevant sign equivalent in British Sign Language, based on the most unanimously agreed translation of those particular words. At the beginning of the book is a page titled, 'This book belongs to' where children can write their name. The signs are given underneath for 'book' and 'belong' and on the opposite page are all the signs of the alphabet so children can learn how to sign their name too. This book includes signs for one or two words beginning with each letter of the alphabet. It starts with A for 'Allah' and 'Angel' and goes through to Z for 'Zam Zam' and 'Zakat'. It includes signs for Islamic/Arabic words such as 'Shahada' (testimony of faith) and 'Taqwa' (belief and trust in Allah) as well as English words that relate to religion such as 'forgive' and 'creator'. There is one sign and picture per page, with five bonus signs on the last two pages of the book. The thing that strikes me about the book is the beautiful illustrations. 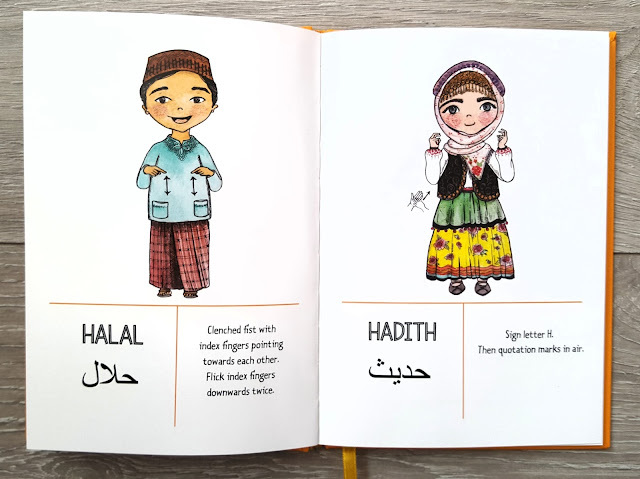 Each page has an illustration of a child signing the sign. These illustrations have been well thought-out. They are bright and colourful and each one is of a child of a different race or wearing different cultural clothing. One of the pictures is of a child in a wheelchair and another includes a child wearing hearing aids. It is clear the authors' aim has been to celebrate cultural diversity and make the book inclusive to everyone and this really comes across. It is great to see a children's book that pushes boundaries and resonates with everyone. 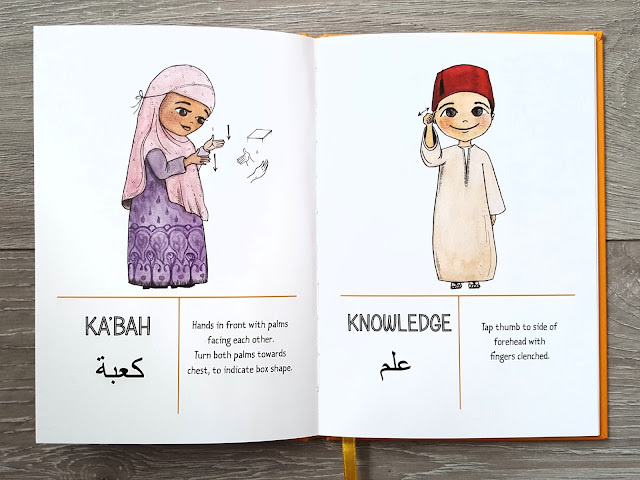 The writing at the bottom of each page includes the word written in English and Arabic as well as an explanation of how to do the sign. Arabic words have the English translation underneath. As soon as we got the book home, my daughter was really keen to take a look at it. She immediately began to learn how to sign the letters of her name and can now sign, 'My name is Delal' confidently. All my children have enjoyed looking through the book at all the different pictures and signs and trying them out. They have also enjoyed teaching some of the signs to friends and relatives. It can sometimes be difficult to work out how to sign some of the signs from a picture so the authors of the book have created some wonderful YouTube videos to complement the book. Not only has this book been brilliant for teaching my children some BSL signs, it has also been a great way for me to introduce the topic of deafness to my children. We have spoken about how some people cannot hear and need to use sign language to communicate. We have also spoken about some ways you can make communication easier when you meet a Deaf person. You can read my article giving tips for hearing people on how to communicate with Deaf people here. 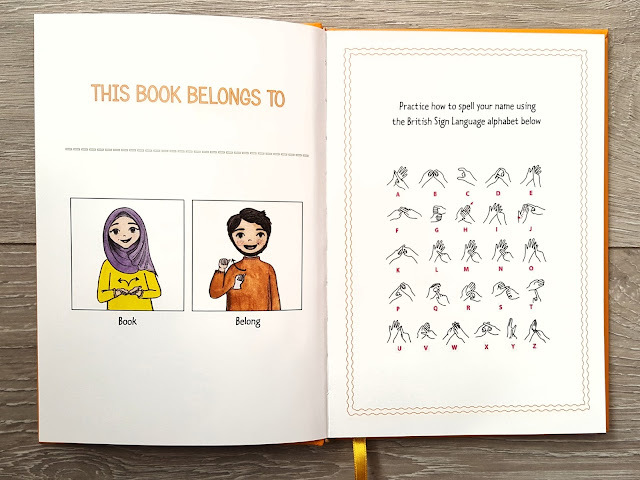 I would recommend this book to anyone who wants to teach their children about diversity, the Deaf community and introduce them to sign language. The book will also be a great resource for professionals who work closely with children with hearing impairment or speech and language difficulties such as global developmental delay or low-functioning autism. I commend the authors for such a well thought out and produced book. I applaud them for bringing a little-known and spoken about subject within the Muslim community into the spotlight. 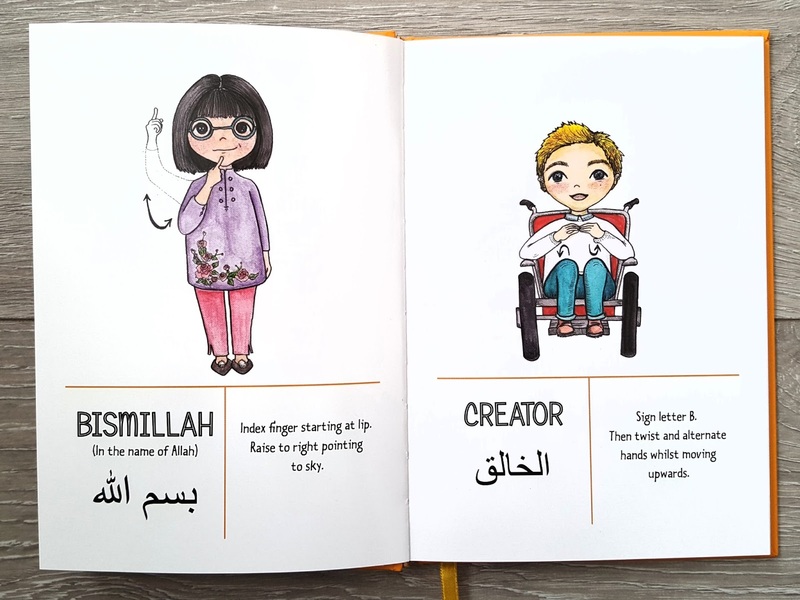 I hope it will go some way to teaching children about diversity and raising awareness of the Deaf community and different ways of communicating. Voucher code for 30% off! If you would like to purchase this book, you will be able to get an incredible 30% off using the vouchercode MCMH30 at the checkout on the website https://amin-yasmin-ltd.myshopify.com/ . This voucher code will be valid until October 13th 2017. 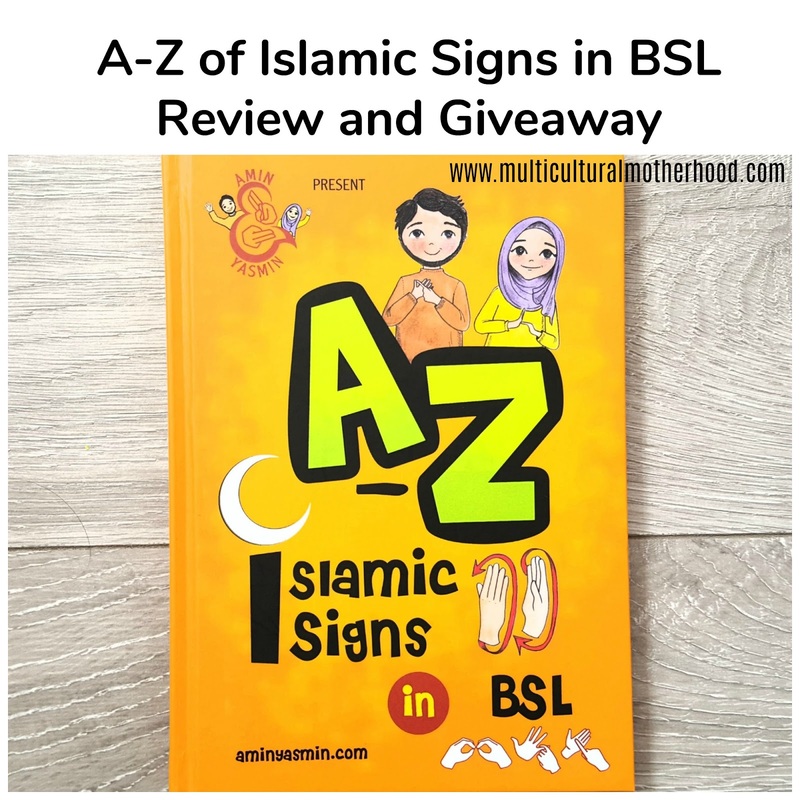 One lucky reader will be in with a chance to win their own copy of A-Z of Islamic Signs in BSL! Giveaway ends 24/09/2017 at 12am. Because this book covers British Sign Language, this giveaway is for UK entrants only. 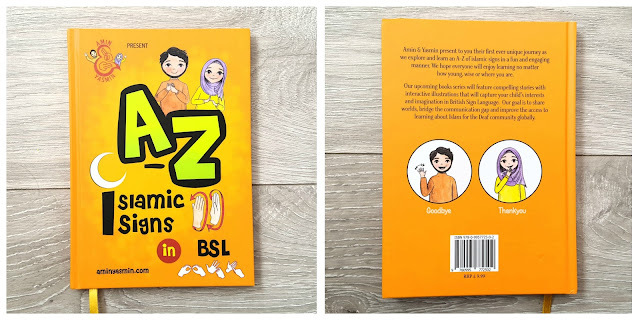 Disclosure: I purchased the A-Z of Islamic Signs in BSL myself in order to use and review it. All thoughts and opinions are my own.